In the effort to locate information regarding the town of Avery, Idaho during the 1910 Fire a great deal of research was done in an attempt to contact living relatiions of Ralph Moriarty Debitt, who was a Forest Ranger in the St. Joe area in 1910. Although some of his relations were contacted, the goal of finding undiscovered pictures or records unfortunately has been unproductive. The research did, however, provide information to create a brief biography of the man who was witness to the death and devastation of the fire, and whose life changed dramatically shortly thereafter. 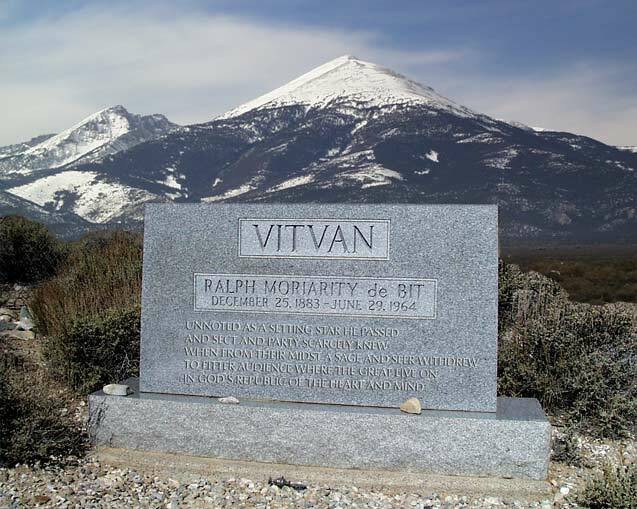 Ralph Moriarty Debitt was the fourth of six children born to William Debitt and Katherine Anne Moriarty. He was born in Brookville, Saline, Kansas December 26, 1883. His father passed away in August of 1898 in Council Grove, Morris County, Kansas before Ralph was 15 years old. In 1900 Ralph still resided in Council Grove with his mother and all five of his siblings. By 1904 he had made his way to North Idaho. On the 6th of December of that year he married Jessica Mabel Needham in Athol, Idaho. A relative has stated that Ralph and "Jessie" met at a barn dance. Jessie was the daughter of Kit Carson Needham and Clara Lillian Hutchins and was the second of their eight children. Jessie was born in Cass, Boone County, Iowa in July of 1885. The Needham's had settled on the east shore of Pend d'Orielle Lake in the town of Lakeview, Idaho. A small community near Lakeview was named after Jessie's mother and given the name Clara. By 1906 Clara and Kit had divorced. Both remarried and spent their lives in Eastern Washington. In September of 1906 Marie Jessie was born to Ralph and Jessie Debitt, their first child. Before reaching the age of two Marie died of typhoid. Edith Marjorie was born to them on June 3 of 1909 and Ralph Moriarty Jr. on November 10, 1910. At the time of the 1910 census, the family of three (Ralph Jr. had not been born) resided in Avery, Idaho where the family likely had arrived several years prior. Ralph was employed by the U. S. Forest Service as the ranger and Jessie is said to be the first postmaster for the town of Avery. Ralph's mother and two of his sisters had also come from Kansas and resided in Spokane, Washington. The catastrophic event that took place in late August of 1910 without doubt had a profound effect on the Debitt family. The 1910 Fire, or "Big Blowup" as it is more popularly known, raged through the forest of which Ranger Ralph Debitt had charge. Despite the fact that no army of men could have prevented the disaster, the results of the fire were horrific. Only a few miles from the town of Avery 28 men lost their lives battling the flames and hundreds of thousands of acres of timberland were scorched in a few short days. The frantic effort to save civilian lives, protect the small town, and provide for those fighting the fire would have been a great burden to any man. Records indicate that the Ranger Debitt, at the age of only 27, did his utmost to counter the inferno the he was confronted with. Within months following the great fire Ranger Debitt abandoned his career with Forest Service. While in Spokane, Washington he came in contact with A. K. Mozumdar who promoted a form of Hindu religion. Debitt was guided by the religion and became a strong follower and advocate of Mozumdar's teachings. He was given the name Vitvan by his mentor. Ralph and Jessie divorced about 1915. 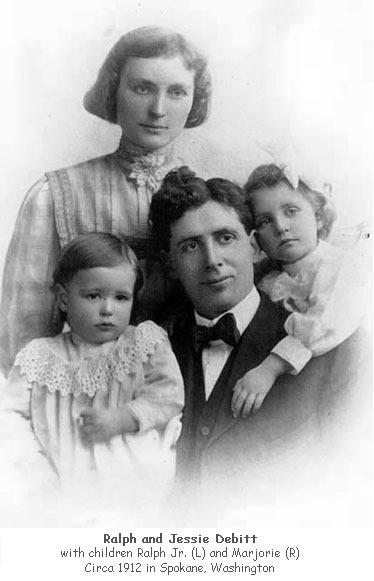 The children, Edith and Ralph Jr, were in the custody of Ralph in 1920 near Seattle, Washington, where Ralph resided with his new wife. On the 1920 census Jessie was shown to be living alone in Los Angeles, California. She soon thereafter returned to Spokane, remarried and resided there until her death. Marjorie, the daughter of Ralph and Jessie lived out her life in southern California. Their son Ralph Debitt Jr. became a prominent, highly respected physician in Kennewick, Washington. Ralph Sr. is known to have married three more times after his divorce from Jessie, and fathered several more children from those marriages. After leaving the Forest Service Mr. Debitt devoted his life promoting his religious beliefs using the name of de Bit or sometimes Debit. In King County Washington about 1915 he lead the Christian Yoga cult. From about 1925 until 1942 he formed The School of Sacred Science on land near Bailey, Colorado that he and his followers called Po-Ahtun. He later established the School of the Natural Order near the small town of Baker, Nevada that was known as Home Farm. The School of the Natural Order continues to exist today. Mr. Debitt published a number of manuscripts and books promoting his beliefs. He also travelled extensively to lecture about his faith. Ralph Debitt died June 29, 1964 about seventy miles from Ely, Nevada on the land that he and his followers referred to as Home Farm. He was buried in a small cemetery nearby. In conclusion it is impossible to know to what extent the events of the 1910 Fire had on the life of ranger Debitt. It is apparent that the life of this bright, able, family man changed dramatically shortly after the fire. Unfortunately, based upon newspaper articles and court documents, he was at times amidst scandal following his career as a forest ranger in the Great Fire of 1910. This biographical sketch contributed by Scott Stranger of Dalton Gardens, Idaho.